AAII QURA’N SCHOOL RENOVATION PROJECT WEBSITE http://www.gofundme.com/IamMedinaBaye has been established by Nasrul Ilm America to raise funds for the structural renovation of AAII’s Qur’an School. PLEASE DONATE GENEROUSLY toward the initial goal of $100,000 for floor to roof renovation, and for the ungoing upkeep of the Qur’an School. Islamic education provides an ethical framework for living in a complex world. AAII offers an Islamic education that is rooted in the true teachings of Islam that counter radical ideologies that distort Islamic principles. AAII is dedicated to developing educational strategies that foster peace and respect among the people of the world. As part of AAII’s commitment to advancing access to Islamic education at all levels, including medical education, AAII’s Founder and Chairman served as President of the University of Elhadji Ibrahim Niass in Dakar, Senegal. AAII’s International Islamic Schools Program enables students from Africa, America, Europe and the Caribbean to experience spiritual, intellectual, physical and emotional growth during their time in Senegal, at the same time being prepared for re-entry into mainstream educational systems and universities throughout the United States, Europe and the Islamic world. Support in the academic subjects they require to facilitate their re-entry into educational systems upon their return home is provided by volunteer teachers from the United States and Europe. Franco phone African students are supported to learn English in preparation for higher education in the United States and institutions in other English-speaking nations. American students return to the United States having acquired language skills in Arabic, French and Wolof.AAII’s Education Program was honored by the World Association of Non-Governmental Organizations (WANGO) with its 2002 Education Award. AAII’s Qur’anic School is respected internationally for educating young male and female Muslims. Students in the Qur’anic School learn to read, write and memorize the verses of the Holy Qur’an toward the goal of becoming Hafiz, i.e., one who has committed the entire Qur’an to memory. Each year, celebrations are held to honor students who have successfully reached this goal. AAII’s Qur’an Schools in Medina-Kaolack and Kossi-Atlanta, Senegal offer an international faculty who teach Qur’an within an Islamic environment and provide students with a rich cross cultural experience. AAII’s Qur’anic School consists of twelve months of instruction. AAII’s Qur’an Schools currently serve 1,800 students. Potential students from throughout West Africa, America, Europe and the Caribbean continue to apply for admission, but are turned away due the lack of teachers, classrooms and dormitories to accommodate them. AAII’s Arabic School offers a complete primary and secondary academic education in the Arabic language. Students learn to think, read, and write in Arabic in all required academic subjects. AAII’s Arabic School consists of ten months of instruction. Students may remain in Medina-Kaolack or travel home for vacation, at their parents’ discretion. AAII’s Arabic School currently serves 600 students. Young Muslim men and women from diverse geographic and cultural backgrounds seeking admission are being turned away due to lack of resources to build additional classrooms, hire more teachers and provide gender-specific dormitories. As a result, many opportunities to provide a balanced Islamic education are lost to the well-financed schools that promote an extremist ideology, and from which Muslim women are completely excluded. Many of the children require nutritional support to enhance their ability to learn and thrive. 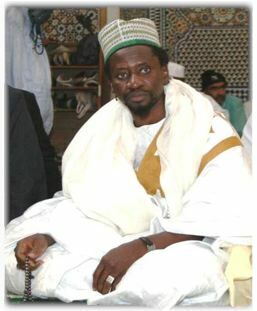 Shaykh Mouhammadou Mahy Cisse, BA, MA, Azhar University, is AAII’s Vice President and International Islamic Schools’ Director of Studies. His leadership in curriculum development and faculty accountability combine modern educational principles with a traditional approach. In addition to his role as the Program’s chief administrator, Shaykh Mouhammad Mahy Cisse provides students with both academic and spiritual guidance in their journey toward an ethical and successful life. In order to meet the rising costs of teachers’ salaries and housing, electricity, water, food and lodging for international students, the Fee for Instruction, Room and Board is $400 USD per month, plus a recommended $50 USD per month to cover students’ laundry, hair care, personal items and snacks. Fees are payable by the 10th of each month via Money Gram or Western Union. Families wishing to enroll more than one child may apply for a ‘family rate’. Upon enrollment, a $100 Revolving Medical Expense Fund must be established and replenished as needed. Living arrangements include both school based and community based housing. It is recommended that parents visit Medina-Kaolack, Senegal prior to enrolling their children in order to familiarize themselves with the community in which their children will be living and the traditional method of teaching students will experience. It is further recommended that children under ten years of age be accompanied by a parent who will remain to provide the necessary care and supervision young children require. For further information about AAII International Islamic Schools, a glimpse of life in the Sufi African Islamic community of Medina-Baye, Kaolack, Senegal, and to apply for admission, please visit http:www.IamMedinaBaye.com. AAII’s Women’s Literacy Initiative established classes for women to learn to read and write in their local languages of Wolof, Pular and Serer. Over 5,000 women participated in this initiative that prepared them to assist in the publication of “Warri”, a monthly publication that is distributed throughout rural villages in the Sine Saloum Region of Senegal. The publication contains articles about issues affecting women and their families. AAII’s Women’s Literacy Initiative is built upon collaboration between the government of Senegal and the Canadian government and reflects AAII’s partnership role in the Senegalese government’s “Alphabetization Program”. AAII’s Kossi-Atlanta Adult Literacy Initiative serves adults in rural areas surrounding Kossi-Atlanta, Senegal. As part of AAII’s deep commitment to ending illiteracy, encouraging continuing education and developing marketable skills, the materials used in this project include academic and computer literacy. AAII’s Kossi-Atlanta Adult Literacy Initiative empowers men and women in these rural communities to enrich their lives through reading, function at a higher level of understanding of the world around them, become more economically stable and to be more effective participants in the education of their children. Support for salaries and housing for ten (10) additional teachers. Construction of dormitories for male students; construction of dormitories for female students. Construction of dormitories to house orphaned children and support for salaries for childcare staff and maintenance workers. Construction, staffing and equipment for an AAII Vocational School to train African Muslims in marketable skills that will enable them to support themselves and their families. Currently family and community are disrupted when men are required to leave women, children and elders behind when they emigrate to find work. Typically, they are gone for years, while their children grow up, and their parents pass away. The ability to earn a living without having to leave their countries is essential for the financial and psychological stability and well being of the family and the entire community. Establishment of Islamic schools throughout West Africa to assure that Muslim children in primary grades through high school are provided with a balanced Islamic education that offers them an intellectual and spiritual alternative to extremist thought. Acknowledgment and support of the role of Islamic education in encouraging moderation and promoting inter-religious understanding and peacebuilding among Muslims and followers of other faith traditions. Development of practical initiatives to re-train teachers, develop new curricula, and develop educational materials that reflect a Sufi perspective, encourage diminishing inter-religious conflict and encourage cooperation among diverse faith traditions. Utilization of distance learning technology to permit people in the United States and other places in the world to learn about Islam from a Sufi perspective in a West African cultural context. Development of educational materials (audio/visual and print) and curricula for use with African Muslim students and American students from diverse religious traditions suitable for elementary, middle and high school aged students. Organization of Sufi conferences throughout West Africa to disseminate information about Islam that is consistent with the letter and spirit of the Qur’an and the example and practice of Prophet Muhammad (SAW). AAII’s International Schools Program invites your support and partnership. For more information about how you can help, please contact us.